Lord, thank you for all that you have blessed me with and by the way Lord I need_________, __________, and __________ (you fill in the blanks). I bet many of you have had or heard prayers like that. We are programmed to believe that we can go to God for everything and He will bless us according to our needs. And believe me, it’s true! God will provide for your every need and even some of your wants if they line up with what God has for your life. But have you ever just stopped and asked, God what is it that I can bless you with or what can I do for you Lord? One of the simplest things you can do unto God is follow His word and be obedient. One way that I’ve learned to be obedient to God is through tithing. Simply put, tithing is giving God 10% of your increase. In my own words, tithing is giving God what is rightfully His without any questions, moans, groans, or I’ll get you on the next go around. I remember when I was a young girl, I would take my loose change or the dollar my mother gave me and put it into the offering tray every Sunday. I would walk down the aisle and politely grace the church with my little dollar and walk back to my seat like I was doing something great because that was what I was taught. I saw church goers give an offering every Sunday but there was never a call by the pastor to bring tithes. That soon changed when I visited what is now my current church home. Over the past several years, I have learned that the first level of tithing is the action of developing a foundation of giving. One would think that I had a strong foundation since I gave my dollar every Sunday. As I grew in Christ, however, I realized that giving was just the start. The ultimate root of tithing was obedience unto God and to trust God with all you have. Many people often state that they don’t understand the concept of tithing; therefore I offer this very simple explanation. For every dollar you earn set aside 10 cents for God. People often use the same excuse of not being able to trust the pastor or other members of the church to use the tithes wisely. My answer to that excuse is always the same, why worry about how the money is being used but rather trust God to fulfill His plans for your tithe. Those that misuse God’s tithe will have to give account for their actions and so will those who continue to willfully rob God through not paying tithes. Remember that the Bible states in Malachi 3:8 that “Will a man rob God? Yet you rob me. But you ask, how do we rob you? In tithes and offerings.” Therefore reside in the fact that when you pay your tithes God sees you as worthy enough to receive a continual pouring of blessings that you won’t have room to receive. We take a chance on much riskier things in life such as the stock market, the lottery, and get rich quick schemes, so why not take a chance on a God that has plans to prosper you and not harm you. God that doesn’t have to worry about how the economy is doing, or whether He picked the right Powerball number, but rather God can do exceedingly and abundantly above all that we could ever ask or think. God never charges you a transaction fee for conducting business on your behalf. I’ve come to the realization that no matter what the bank statement says I have in my account, I know through obedience my needs are met because of the deposit that I made in heaven. A withdrawal slip is never necessary because of my obedience to God and knowing in my heart and my mind that He will provide my every need. Nevertheless, remember you have to make a deposit in order to make a withdrawal. Many people choose to overlook tithing by making the argument that tithing is of the Old Testament and not of the New Testament. My argument, however, is neither for the old or the new, but simply that God gave us the Bible to learn about Him and as a guide for life, therefore if it’s in the Bible then He must have thought it was important enough for it to be there. Therefore, we should avoid picking and choosing what we want to take from the Bible and live by, but choose to believe it in its entirety. I am not sure about you but I want all the blessings that God has for me. If tithing is one way to get more blessings than I have room enough to receive, I constantly say God here is all of me and a blank check, Lord you fill it in. 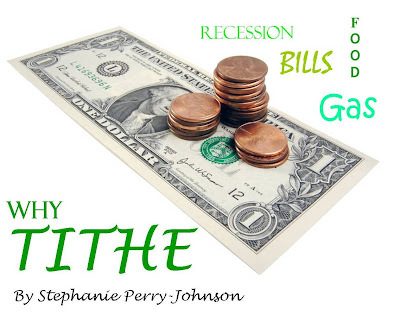 *Stephanie Perry Johnson is a Senior Financial Analyst for FedEx and Contributing Writer for DIVINE Magazine. Tagged Scriptures, Stephanie Perry Johnson, Tithe. Bookmark the permalink.